The Pioneer PLX-500 High-Torque Direct Drive turntable inherits the layout of its older sibling, the PLX-1000 professional turntable, producing warm, clear analogue sound at a more affordable price. Whether you're cutting your teeth with regard to performing with vinyl, want to listen to your coveted record collection at home, or even want to digitise your collection using Pioneer's free rekordbox software, the PLX-500 has you covered. Utilising their wealth of knowledge, Pioneer has built this beauty to last, and offers exceptional vibration damping with precise playback. The PLX-500 layout is about as simple and elegant as you could wish for, presenting you with a 332mm diameter aluminium die-casting turntable, which is powered by a 3-phase brushless DC motor and utilises an electronic braking system. The high-torque direct-drive platter responds well to the subtlest of touches, ensuring perfect tactile control during the most demanding of sets. In order to make the PLX-500 as robust as possible, the chassis is built using heavy-mass die-cast zinc to add weight and minimise movement during operation. The sensitivity of the platter ensures absolute tactile control. The smooth direct drive system - with a starting torque of 4.5kg/cm - ensures that no matter how frenetic your technique is, the PLX-500 will match you every step of the way. Reaching its fixed rotation speed in just under a second (at 33 1/3 rpm), you can rest assured that from the moment you hit go until the second you stop, the rotational speed of the turntable will remain accurate and consistent. The tempo control allows you to provides a range of tempo adjustments from +/-8%, giving you a massive amount of choice with regard to pitch speeds. Hit the "Reset" button that sits next to the smooth tempo adjustment slider and you're instantly restored to a +/-0% fixed rotation speed. Simple but highly useful for making critical adjustments whilst performing. Audio routing from the stylus to the RCA or USB outputs is kept to a minimum to effectively reduce distortion. The S-shaped tone arm is designed to be discreet enough to stay out of the way of wandering hands, but it robust enough to take the knocks that can occur during frantic live performances. Rubber insulation minimises the possibility of howling effects affecting the output signal during playback. The RCA jack enables you to connect directly to your sound system or speakers, whilst the USB-B port allows you to connect directly to your computer for seamless recording of your vinyl collection for conversion to a digital format. The supplied rekordbox software is compatible with both PC and Mac. If you upgrade to the rekordbox dvs Plus Pack, you get access to low latency scratch control with music in your recordbox library. If you're an audiophile who is looking for a fantastic turntable to play your vinyl on, then you'll love this. 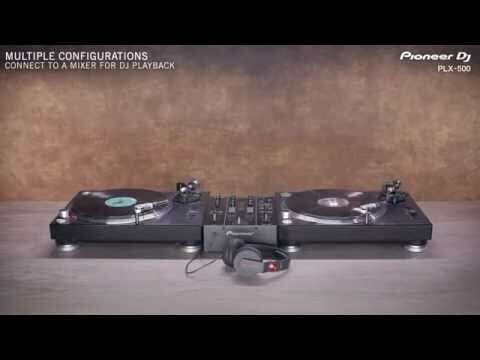 For the more adventurous, for professional DJs, and for those who love to let their fingers do the talking, the Pioneer PLX-500 analogue direct-drive turntable is simply awesome. Combine a pair of these beauties with a Pioneer DJM mixer (sold separately) and you'll be in scratch heaven!